Recently, with family in town I needed a quick and simple dinner to fill up my guests. So I consolidated my pantry and fridge and came up with this delicious concoction. Soups and stews are a wonderful way to get in lots of vegetables, grains, and greens. They are easy to make in large batches, so you can always have a meal ready to go during the week. 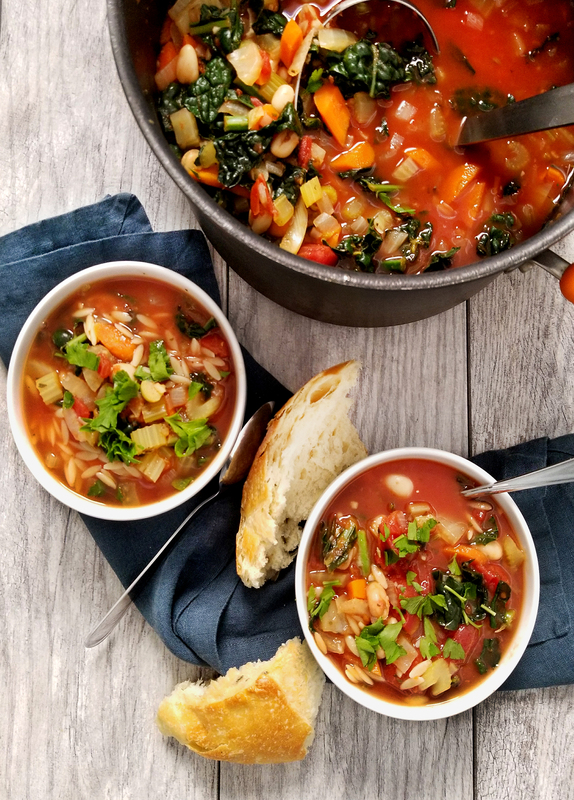 I particularly love minestrone because it utilizes the concept of “kitchen sink” cooking. From the Italian origin minestare meaning “to serve” minestrone soups normally consist of humble ingredients; including vegetables, tomatoes, beans, and some sort of pasta. In rustic variations of this soup, Italian sausage is used. 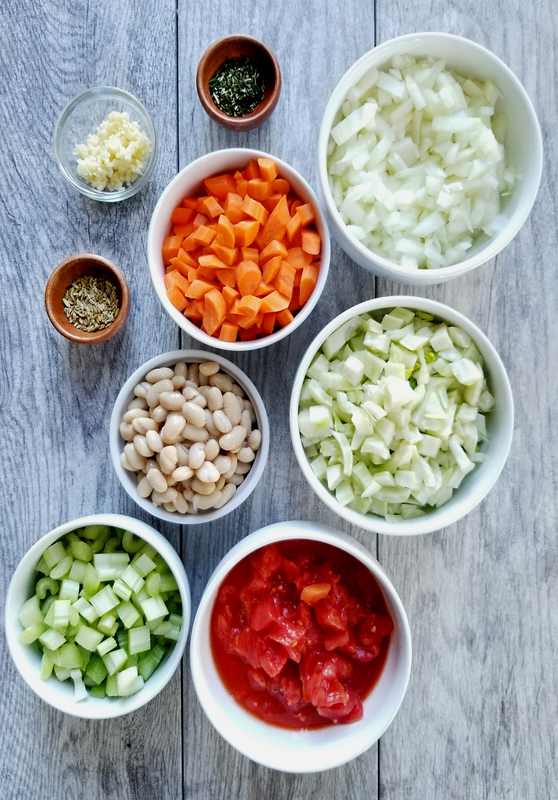 I thought I would use one of the staple flavors of Italian sausage; fennel seed, to incorporate a rich aromatic addition to this meat-free vegetable stew. 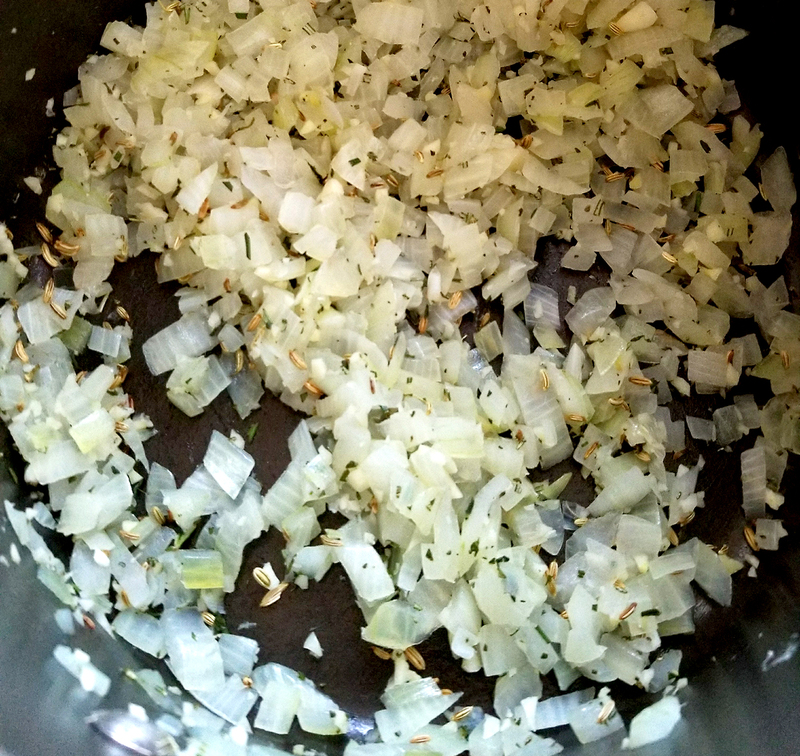 Adding whole fennel bulb along with the seeds gives this soup a unique flavor and lightness that is hard to achieve with meat. Besides the fennel bulb, all of the other ingredients are pretty simple and convenient. 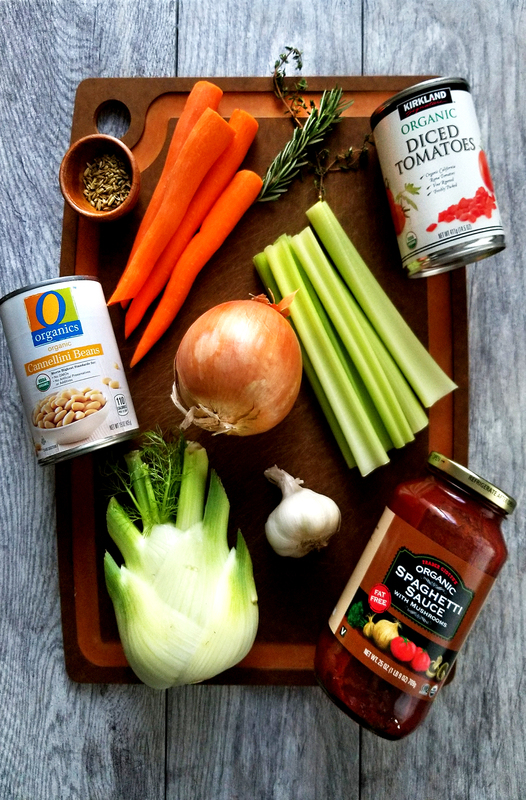 The base consists of fresh onions, garlic, carrots and celery, followed by easy canned tomatoes, canned beans, vegetables stock, and low-fat pasta sauce. 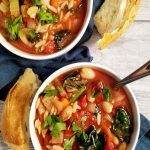 You can make a big batch of soup without the pasta, and heat it up throughout the week when you are ready. If you are using pasta as your starch I personally like cooking and storing it separately. * It can become too soft and absorb the liquid if it sits overnight. Plus, if you have someone who likes more pasta then the normal human (my husband) you can portion it in the bowls before you pour the hot soup over. This soup is simple, hearty, fresh, herbaceous, creamy, and with an undertone of licorice from the fennel, oh so delicious. Good enough for me, let’s get cooking! 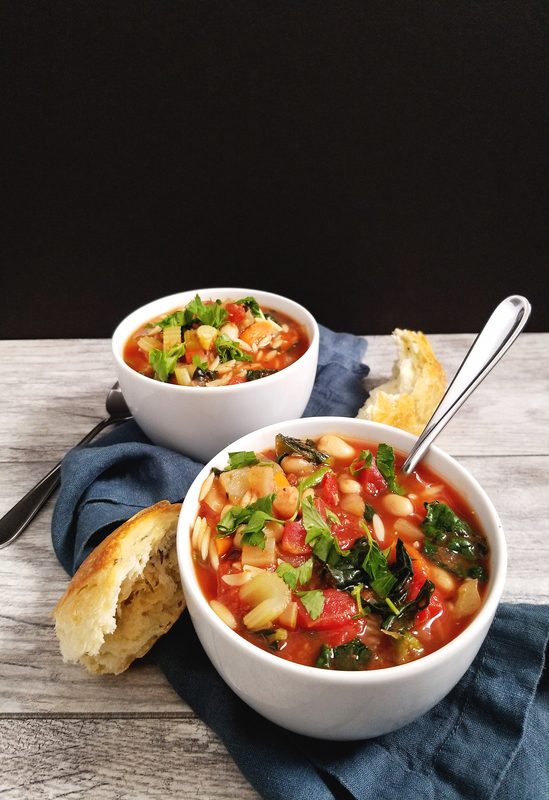 A simple minestrone that you can throw together quickly with easy pantry staples and fresh fennel bulb! Place a large sauce pot over medium high heat. Add the onions and a splash of water and sauté for a few minutes, until slightly soft. Then add the garlic and stir for 30 seconds. Add the fennel, carrots, celery, and fresh herbs. Add another splash of water, stir for 4-5 minutes until vegetables are tender, add a pinch of salt. Add the canned tomatoes and vegetable stock, bring soup over high heat until it comes to a simmer. Simmer for 5-10 minutes, then add the cannellini beans, and the kale. In a small pot, bring water to a boil. Cook orzo using the instructions on the package (5-8 minutes depending on the brand. When cooked, drain the pasta through a colander and run cold water over the pasta, stopping the cooking process. To serve, portion the orzo into the bowls then pour the hot soup over the pasta. Finish the soup with freshly cracked black pepper.